If you are thinking about ordering custom private property signs for the property or building suite you manage, whether its custom no trespassing signs, no parking signs, or even custom ADA signage, you need to consider typography, text orientation, image quality, color and overall size of the sign before you place your order. Many businesses and organizations prefer custom aluminum signs to standard generic signs for a number of reasons. Some like to add their image to aluminum custom signs as a way of increasing brand recognition. Others like to use custom made parking signs in order to provide specific direction or post preferred parking for company executives. A custom no trespassing sign can provide specific warning that is more attention-getting than standard posted signs. Typography -- Make sure the lettering of your text is sufficiently large enough to be viewed from a distance. As such, your custom message should be short and sweet so as to be easily visible. Make sure to proofread your sign a few times before finalizing the order. Text Orientation – Where and how you layout the text and images on your custom private property sign is important. Take care to verify the message says precisely what you want it to say. Put the text itself before the image (unless it’s the using a company logo). Logo or Image Use – Submit only high resolution, 300 DPI-quality images or logos for custom private property signs. The image or logo should be a vector based format (either tiff, jpeg, PDF, or png files). Sign Size – The size of the custom sign you order must fit accordingly with the space it will fill. Too big and the sign could look out of place and yet too small and it could be overlooked. If you have any questions or concerns about ordering your custom signs online, you can contact the customer care professionals for assistance. 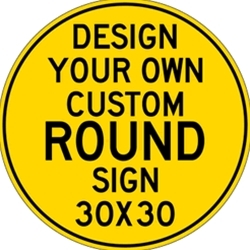 Take care to proof the full mock-up of your custom sign before you submit your order.